While weeding in front of my house yesterday I encountered a group of tourists who had come to Salem for the “witches” but were surprised to find so many nice buildings too. Poor people! Once we started chatting I couldn’t stop myself from subjecting them to a lecture, well, several really: first I told them all about Samuel McIntire and the merchants and sea captains who built Chestnut Street and then we got into the witch trials. They did ask questions, but clearly it’s a good thing that the semester is about to start. One thing became clear in our “discussion”: they thought Salem was the only place in the world that prosecuted accused witches, at least after the “Dark Ages”. Even after fifteen years of teaching a popular course on the thousands of witch trials that occurred in early modern Europe, I was surprised. The singularity of Salem always bothers me; “our” trials are so seldom placed in western or global context, at least outside of academia. 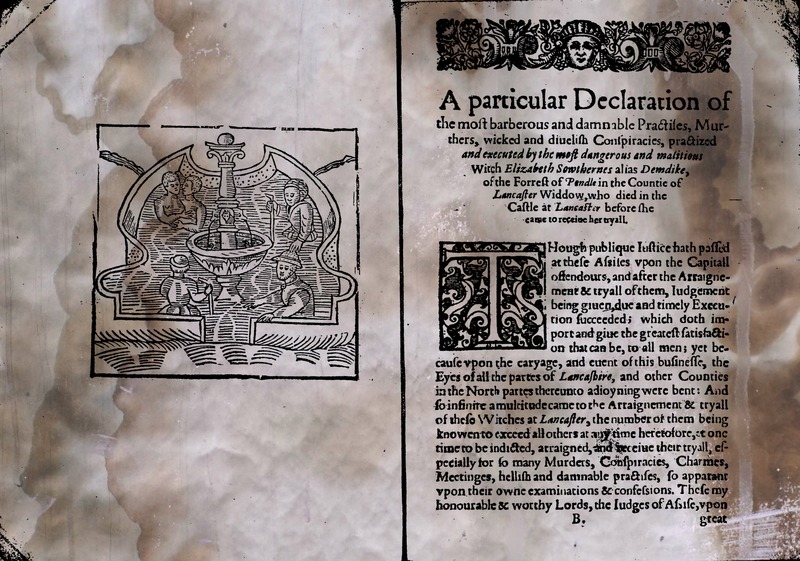 There are important parallels between the Salem trials and the largest and most notorious English witchcraft prosecution, the Lancashire (“Pendle”) trials in northern England in 1612. The Pendle trials were held 401 years ago this week, and their 400th anniversary was commemorated last year. Salem and Pendle were both (relatively speaking) “frontier” communities, with the Pendle district of Lancashire located in the “dark corners of the north” of England, where various types of nonconformity still reigned. 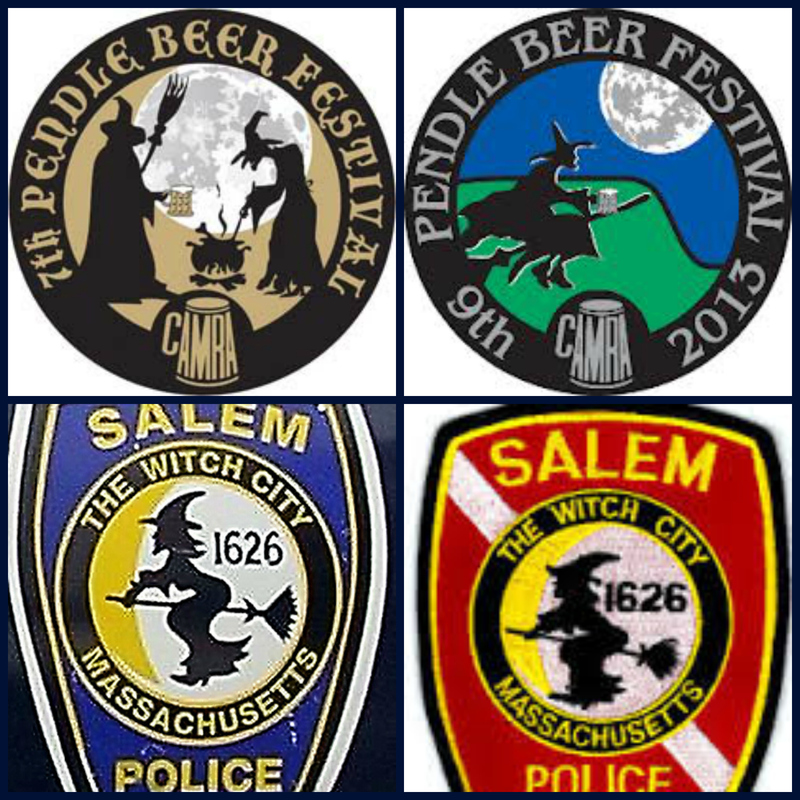 Salem cast a much wider net (185 accusations, 59 trials, 31 convictions, 19 executions, one death by torture/interrogation) than Pendle (16 trials and 10 executions, with one death in prison), but both were notoriously collective, conspiratorial episodes–unusual in the history of English prosecutions for witchcraft. 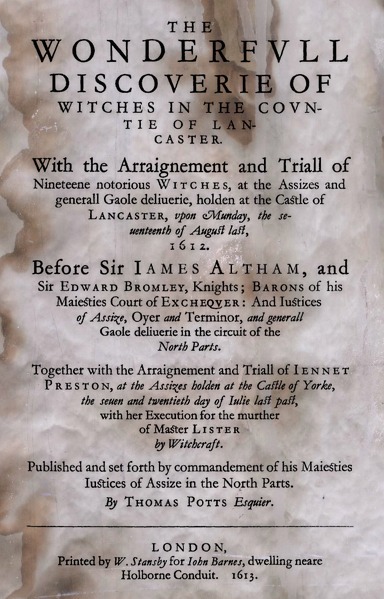 Both trials were well-publicized, with the Pendle “source”, (more of a personal reflection really), clerk of the Lancashire court Thomas Potter’s Wonderfull Discoverie of Witches in the Countie of Lancaster (1613) being particularly influential. Thomas Potts, The Wonderfull Discoverie of Witches in the Countie of Lancaster. London, 1613. STC 20138. But the most important comparison/connection between Pendle and Salem was the admission of legal testimony by a minor in the former trials, which set the precedent for the latter. Before the Pendle trials, the testimony of children under the age of fourteen was inadmissible in English courts, but nine-year-old Jennet Device was the star witness of the 1612 trials, offering up testimony that implicated her entire family as well as others. Jennet’s family would have been vulnerable anyway–they were a marginalized family led by a “cunning” matriarch, and probably represented the lethal mixture of nuisance and nonconformity to the community–but her vivid testimony was key to their conviction. Jennet was the informer at what became a sensationalistic show trial. Like Salem, the Lancashire trials seem to have become a somewhat self-generating process, engulfing the accusations of the “Pendle Hill” witches as well as so-called “Samlesbury Witches” who were also implicated by the testimony of an adolescent girl. The Salem girls most definitely had their forerunners, and perhaps their inspiration. Then, of course, there is the cultural aftermath, theatrical and fictional accounts based on Pendle and Salem, tourism, commemorations. Several decades after Pendle, Thomas Heywood brought his comedy to the London stage, while several centuries after Salem, The Crucible transformed the American trials into an ongoing allegory. Salem has, of course, transformed itself into “Witch City”, and in the Pendle district there is a Witch Way bus service with individual buses named after the officials and victims of the Lancashire trials. 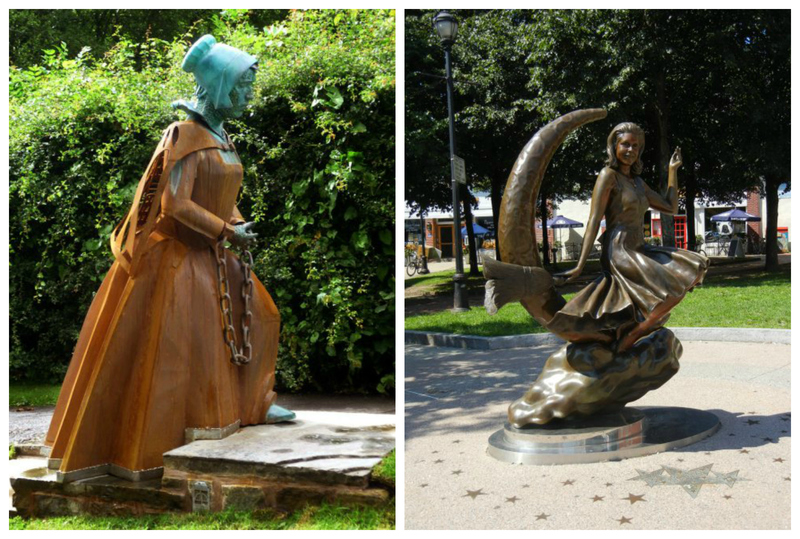 There are statues in both places, although Pendle’s is of a real victim, Alice Nutter of the village of Roughlee, and ours is of Samantha Stevens, a fictional television character! (Of course we have the beautiful and meaningful 1992 Witch Trials Memorial, but I am afraid that more tourists see Samantha). There are also logos galore, on both sides of the Atlantic, official and otherwise, with just a sampling below. This entry was posted on Monday, August 19th, 2013 at 6:53 am	and tagged with Commemorations, England, Pendle witches, Salem witch trials, Samlesbury Witches, Samuel McIntire, Witch City, Witch Trials and posted in Culture, History, Salem. You can follow any responses to this entry through the RSS 2.0 feed. Very interesting post and I really enjoyed learning more about Pendle. My mother’s last name is Pendlebury, meaning “coming from the village of Pendle”. 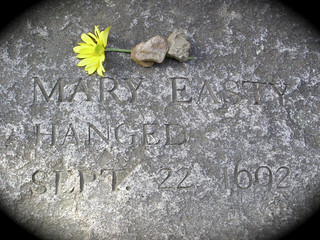 I hope to someday go in person to see where my ancestors came and visit the site of the witch trials. Oh you should, as soon as you can–I was in the region about ten years ago, but do not know it very well. I visited the Salem witches memorial and was deeply impressed. . . . .
Oh, I’m glad, Melinda. It is a very reverential site. Loved the article. 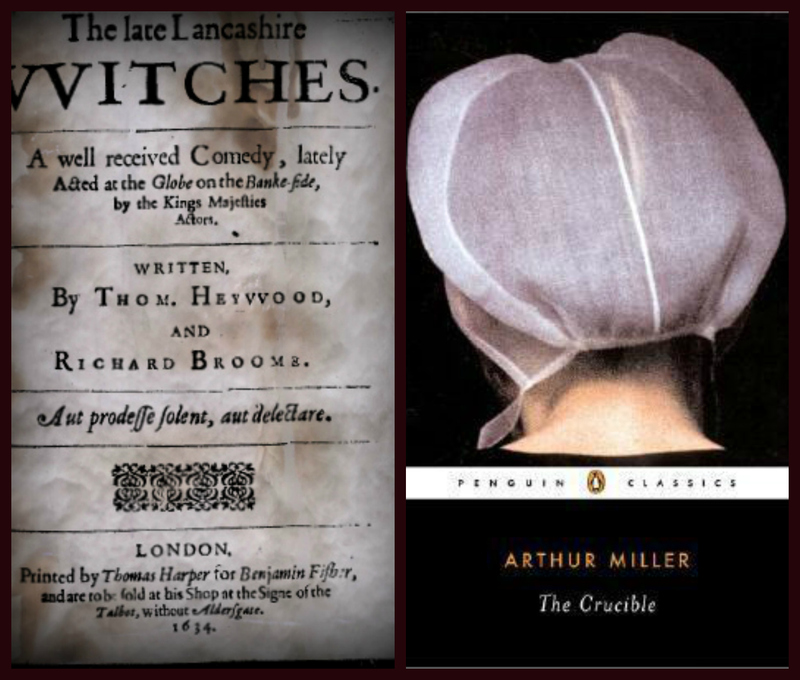 Im currently doing research into child witnesses in early modern witchcraft trails with a special focus on the pendle witch case. Coming from the area it is quite special to me. If you came across anything related while researching your post, I would be grateful if you could pass it on. I think that’s a great topic–the literature on the Swedish witch trials would be particularly helpful there, certainly. I am from Pendle and always grew up with my grandma telling me stories about the witches. Anything that hasn’t made it into the written record? I am from Pendle and always grew up with my grandma telling me stories about the witches.It such a sad but interesting period of history. Pendle has a really special, brooding atmosphere.